We organized a spectacular factory inauguration for the Hungarian Apollo Tyres plant, which was the largest greenfield investment in Hungary at the time. We provided a full service for 1200 guests who arrived to the event from all over the world, including nearly 50 international and twice as much Hungarian journalist. The factory – together with the company’s managers – was inaugurated by Prime Minister Viktor Orbán. It was our duty to organize the event in line with strict governmental principles, in close cooperation with the Cabinet Office of the Prime Minister and with Counter Terrorism Centre. In the framework of this cooperation we prepared an exclusive meeting for these organizations with the participation of Apollo leaders and key decision makers. The Construction Video was part of the opening show, which we made at the construction site, following the process from the first bricks to the start of the first production line. For this we used cutting-edge timelapse, go-pro and stop-motion techniques. We announced to the public in advance that there will be a huge show at Gyöngyöshalász: Apollo welcomed Hungary with a unique 3D light painting which appeared on the Chain Bridge in Budapest. The light painting named “Hello Budapest” had been reported by the press on the evening before the solemn opening ceremony. Besides that photos of the Apollo-colored bridge became a viral content on Facebook. In order to achieve a 360° communication we placed a countdown into the front page of the county’s daily newspaper complemented by a 1/1 article. 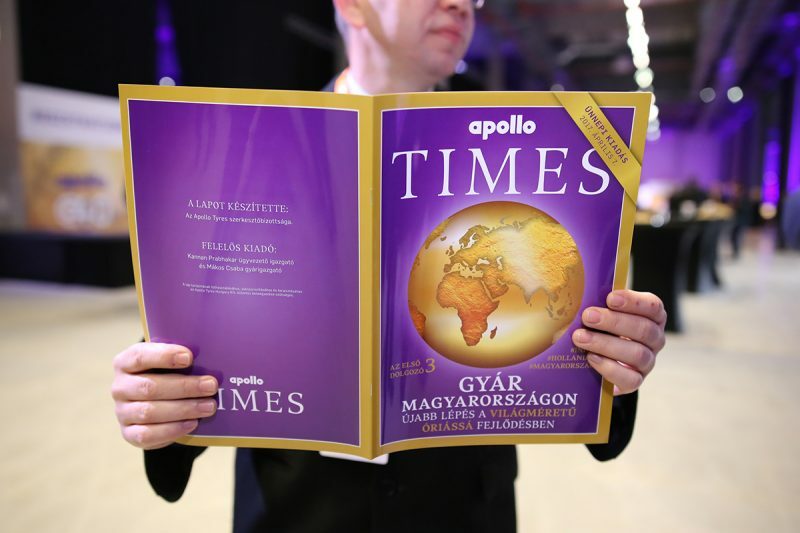 Moreover we prepared the special edition of the “Apollo Times” internal magazine, and posted content to every social media channel of Apollo Tyres. The event was reported by all leading national TV channels, news and print magazines, complemented by the international press coverage including a Financial Times report. The appearances together amounted to nearly EUR 575 000 worth of media value.